Multi-cultural, multi-ethnic Malaysia is home to a large Chinese population. Recent estimates indicate that nearly 25 % of Malaysia’s 29 million-strong population is of Chinese origin. It is believed that Chinese traders arrived in in Malaysia arrived from the Mainland, as early as the 15th century. Some of these traders settled down in Malaysia and intermarried with the women of the local population, giving birth to the Peranakan or Straits-Chinese culture. Since then Chinese immigration to Malaysia tended to occur in waves from various provinces of Mainland China. Today, the Malaysian Chinese form the second largest ethnic group in the country and play a prominent role on the economic front of the country. They have assimilated into the fabric of Malaysian society but continue to maintain their native customs, traditions as they strive to maintain their cultural identity. Chinese festivals like various other festive celebrations mark the passing of time in the course of a year. Chinese festivals follow the lunar calendar and hence the dates of these festivals change every year. 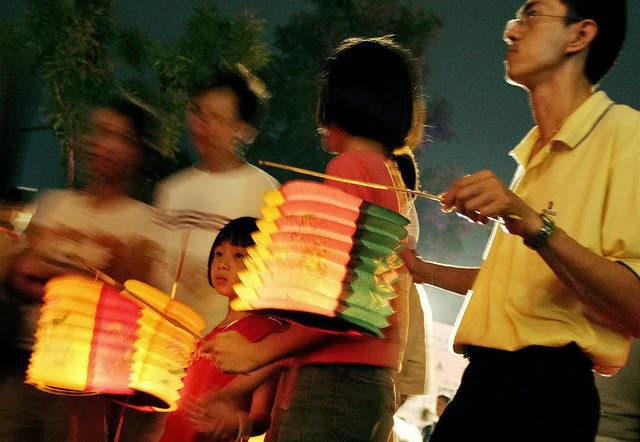 Perhaps the most important Malaysian Chinese festival is Chinese New Year. As in the case of all other Chinese festivals, the movements of the moon also determine the dates for Chinese New Year. The festival is thus generally celebrated either at the end of January or then in mid or early February each year. Malaysian Chinese usually preform a big spring clean of their homes in days leading up to the festival. They also decorate their homes with red and gold trimmings, as they believe red to be an auspicious color. Elders in the family also distribute Hong Bao(red packets stuffed with cash) to the young ones in the family. Employers are also expected to distribute Hong Bao amongst their staff and on an individual level, you are expected to distribute Hong Bao to anyone who has rendered any service towards you during the year. It is customary to stuff these red packets with crisp, new notes so its not uncommon to see long, lines outside banks in the days leading up to Chinese New Year as every body tries to acquire new notes. The practice of distributing Hong Bao is quite similar to distributing Baksheesh during Diwali. 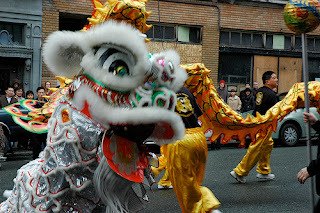 Dragondances and the consumption of traditional Chinese pastries and foods like Nian Gao and Yu Sheng (a raw fish preparation) are other hall marks of the festival. Chinese New Year is a major public holiday in Malaysia and many shops and establishments are shuttered during its duration. The Duan Wu Jie (Dragon Boat festival) falls on the 5th day of the 5th lunar month and is usually celebrated in June. This ancient festival which dates back 2000 years, is associated with the popular poet Qu Yuan, who drowned himself in the Mi Lo River to protest against corrupt leaders of his time. The Dragon Boat festival is celebrated with great enthusiasm by Malaysian Chinese who host dragon boat races in various locales. Dragon boats are slim, multi-person row boats which are not unlike the snake boats of Kerala. The best spot to view these exciting dragon boat races is in Penang where several competitive events are held at the Teluk Bahang Dam. Zhong zi , a dumpling made of rice and various filling is the traditional food associated with this festival. Many Chinese families prepare these Zhong zi which are wrapped in bamboo and lotus leaves and are thrown in the river. The Chinese hope that the fish will eat the dumplings rather than their venerated poet, Qu Yuan. The Hungry Ghost festival is celebrated on the seventh month of the lunar year. During this time, Chinese all over the world indulge in ancestor worship by offering food and other items to the departed souls. Food and papier-mâché representations of material items like houses, cars, gold are offered and often Wayangs (Chinese operas) are also staged to honor the dead and entertain restless wandering spirits. The 15th day of the eighth lunar month sees the celebration of the Mid-Autumn festival. Family and friends meet for dinner at homes adorned with sparkling lanterns. They partake of sumptuous feasts, which are rounded off with the consumption of traditional pastries, the calorie-laden moon cakes which are available in various flavors and feature varied fillings. The host families and their guests then venture out to marvel at the big new moon. The well-known Buddhist festival Vesak, is usually celebrated on the 15th day of the fourth lunar month. The celebration features the offering of prays and chants at various Buddhist temples and shrines. The festival commemorates the day Lord Buddha attained enlightenment and hence the temples are also beautiful decorated with lights and flowers for the occasion as vegetarian meals are offered to devotees who visit. A scintillating parade is also taken out in cities like Kuala Lumpur to celebrate the occasion. Your trip to Malaysia is bound to receive another dimension, if you choose to visit during a popular Chinese festival.